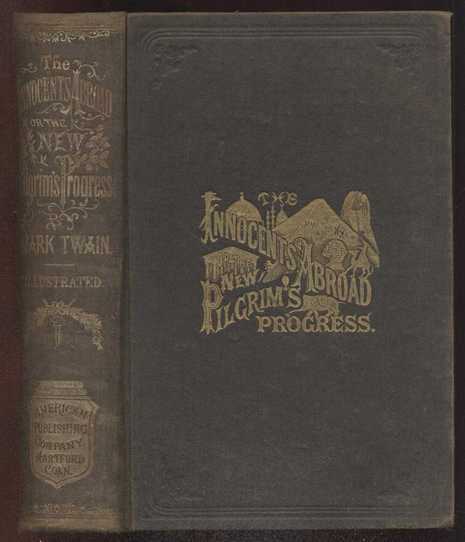 The Innocents Abroad, or The New Pilgrims' Progress was published by American author Mark Twain in 1869. The travel literature chronicles Twain's pleasure cruise on board the chartered vessel Quaker City (formerly USS Quaker City) through Europe and the Holy Land with a group of religious pilgrims in 1867. It was the best selling of Twain's works during his lifetime. At first blush, Innocents Abroad is an ordinary travel book. It is based on an actual expedition, in a retired Civil War ship (the USS Quaker City). The excursion upon which the book is based was billed as a Holy Land expedition, with numerous stops along the coast of the Mediterranean Sea, as well as a train excursion from Marseilles, France to Paris for the 1867 Paris Exhibition, and a side trip through the Black Sea to Odessa, all before the ultimate pilgrimage to the Holy Land. Twain records his observations and critiques of various aspects of culture and society he meets while on his journey, some more serious than others, which gradually turn from witty and comedic to biting and bitter as he progresses closer to the Holy Land. Interestingly, once in the Holy Land proper, his tone shifts again, this time to a combination of his former light-hearted comedy and a reverence not unlike the attitude he had previously mocked in his traveling companions. Many of Twain's criticisms are based on the contrast between his own experiences and the often grandiose accounts in other contemporary travelogues, which were regarded in their own time as indispensable aids for traveling in the region. Above all others, Twain lampoons William Cowper Prime's Tent Life in the Holy Land for the author's overly sentimental prose and his encounters with native inhabitants, which often turn violent. Twain also makes light of his fellow travelers and the natives of the various countries and regions he visits, as well as his own expectations and reactions. A major theme of the book, insofar as a book assembled and revised from the newspaper columns Twain sent back to America as the journey progressed can have a theme, is that of the conflict between history and the modern world; the narrator continually encounters petty profiteering and trivializations of the past as he journeys, as well as the strange emphasis placed on particular events in the past, and is either outraged, puzzled, or bored by the encounter. One example can be found in the sequence during which the boat has stopped at Gibraltar. On shore, the narrator encounters seemingly dozens of people intent on regaling him, and everyone else in the known world, with a bland and pointless anecdote concerning how a particular hill nearby acquired its name, heedless of the fact that the anecdote is, indeed, bland, pointless, and toward the end, entirely too repetitive. Another example may be found in the discussion of the story of Abelard and Heloise, where the skeptical American deconstructs the story and comes to the conclusion that entirely too much fuss has been made about the two lovers. Only when the ship reaches areas of the world that do not exploit for profit or bore passers-by with inexplicable interest in their history, such as the passage dealing with the ship's time at the Canary Islands, is this trait not found in the text. This reaction to those who profit from the past is found, in an equivocal and unsure balance with reverence, in the section of the book that deals with the ship's company's experiences in the Holy Land. The narrator reacts here, not only to the exploitation of the past and the unreasoning (to the American eye of the time) adherence to old ways, but to the profanation of religious history, and to the shattering of illusions, such as his dismay in finding that the nations described in the Old Testament could easily have fit inside many American states and territories, and that the kings of those nations might very well have ruled over fewer people than could be found in some small towns. This equivocal reaction to the religious history the narrator encounters may be magnified by the prejudices of the time, as the United States was still primarily a Protestant nation at this point. The Catholic Church, in particular, receives a considerable amount of attention from the narrator, seemingly not because of any particular differences in doctrine that it may have with the narrator's own attitudes, but, rather because of its institutionalized nature. This is particularly apparent in the section of the book dealing with Italy, where the poverty of the lay population and the relative affluence of the church causes the narrator to urge, in the text of the book, if not directly, the inhabitants to rob their priests. On this day in 1869 Mark Twain's The Innocents Abroad was published. This second book, the most popular one in his lifetime, was a distillation of the newspaper articles Twain had written during his trip to Europe and the Holy Land in 1867. Even with the distilling, Twain said he regarded the book as God regarded the world: "The fact is, there is a trifle too much water in both."